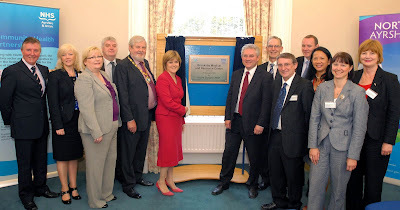 THE new Brooksby Medical and Resource Centre in Largs played host to Nicola Sturgeon MSP, Cabinet Secretary for Health and Wellbeing and Deputy First Minister, for the formal opening of the ground-breaking centre in Ayrshire. The centre is an innovative partnership between North Ayrshire Council and NHS Ayrshire & Arran, bringing together a full range of health and council services for the people of Largs and the surrounding area. Before performing the official opening in Brooksby House’s stunning ceremonies room, Ms Sturgeon toured the centre and met staff in the reception area, therapies suite (offering podiatry, physiotherapy, occupational therapy and speech and language therapy) and registration services. She also met pupils from Largs Academy, whose artwork decorates the centre’s main reception area. Council and health services work alongside each other in the centre, providing everything from GP medical care to housing services. 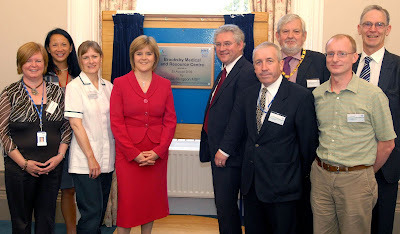 Nicola Sturgeon added: “With the opening of Brooksby Medical and Resource Centre, the people of Largs have a one-stop-shop they can truly be proud of, and which I am sure will serve them well for years to come. “At Brooksby, people can access a wide range of health services – from podiatry and physiotherapy to community midwifery and health visitors. In addition, thanks to the partnership between NHS Ayrshire & Arran and North Ayrshire Council, people can also access a wide range of council services. There are currently 566 Ayrshire business stories permanently archived on this site. To locate those of most interest to you, please use the site search facility in the top left hand corner of this page. Type your search term in the white box, then click “SEARCH BLOG”.